It's not always easy to be brave! Book longs for adventure but is too scared to leave the library. Then Book meets Emma " and learns how to be brave! Scaredy Book, the latest picture book from EK Books, contains the perfect message for kids afraid of leaving their comfort zone (and hand-wringing helicopter parents too!). 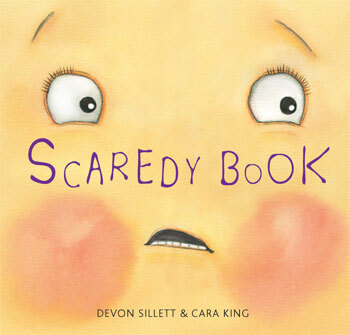 Scaredy Book author, Devon Sillett, is a former radio producer who is now doing her PhD in Australian Children's literature. Devon is passionate about the capacity for books to inspire the imagination, and about libraries as jumping off places for exciting voyages into the unknown. (She loves libraries so much in fact that she was married in one!) In her latest picture book Devon asks the question; what if a book was too scared to leave the library? Book lives at the library and desperately wants to go outside, but is intimidated by all the things that might happen -out there'. A page might get torn. Book's cover might get dirty. Book might never be returned to the library! Meanwhile, Emma loves visiting the library and delights in the many adventures to be had in the stories she finds there. When Emma meets Book, they find they are just what each other needs. Together, Book and Emma move out of their comfort zone to try new things, meet new people, and enjoy a few quiet adventures " climbing trees, laughing in the rain, and even cheering along at a soccer match. Along the way, they discover that -out there' needn't be scary if you just take it one step at a time. Children and parents alike will enjoy this story about being brave, taking risks, and living to tell the tale! Devon Sillett is a former radio producer, turned writer and reviewer. She has loved books as long as she can remember " so much so that she even married her husband Matthew in a library! Currently, she teaches in the writing department at the University of Canberra, where she is also a PhD student, researching Australian children's picture books. Her first picture book, The Leaky Story, was published by EK in 2017. Cara King is a designer and illustrator, who runs her own design business, Caratoons. She is based in Melbourne.